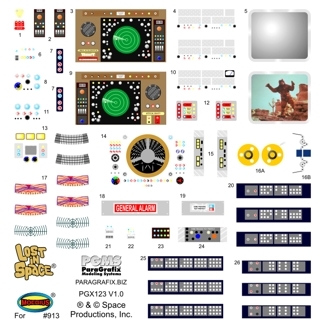 Printed by JT Graphics, the industry leader, these water-slide decals make short work of detailing the intricate control consoles inside the Moebius Jupiter 2 model kit. All colors have been exhaustively researched to match the original set as closely as possible. Ensure that your ship looks just like the real thing in a fraction of the time. Includes special metalic inks for that extra measure of realism.